The gates of hell in Dante’s Inferno” warned all who entered to abandon hope. At first glance, the warning might also apply to those teeing it up at the Purgatory Golf Club in Noblesville, Ind. Stretching 7,754 yards from the back tees, with 133 bunkers and knee-high rough, this Purgatory seems like everlasting torment. But in truth, this exciting new public course 28 miles northeast of downtown Indianapolis offers encouragement for the future. “That’s because second-generation designer Ron Kern has created a thoroughly modern layout deeply rooted in the past. The course has seven par 4s of more than 450 yards and a devilish par 5 measuring 741 yards, but each hole has six tees to choose from,reducing the task in big increments at each tee. 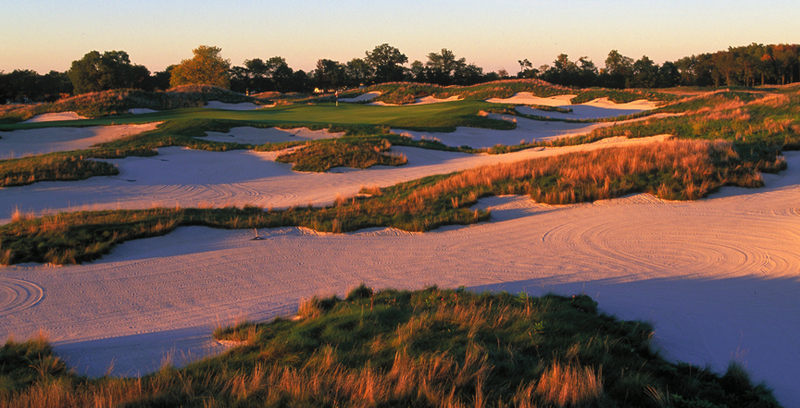 “Kern’s bunkers were inspired not by Lucifer, but by Alister Mackenzie, one of golf’s greatest architects. Kern captured not only the flash of Mackenzie’s style, by saddling each bunker within a framework of knobs, but also the substance. Some define strategies. Others merely decorate. All look penal, but Kern filled them with packed limestone, so balls don’t bury. Instead, they just roll downslopes to the bottom.